This rare volume of the Journals of Congress, covering the pivotal year of 1776, has an unusual printing history. The first 424 pages were printed in Philadelphia in 1777 by Robert Aitken. The project was interrupted when the British marched into Philadelphia on September 26, 1777. Congress fled, and after a day in Lancaster established itself in York, Pennsylvania. Aitken escaped with some of his finished sheets but had to abandon his press. On the other hand, John Dunlap, the original printer of the Declaration of Independence, managed to remove his press. In May 1778, Congress hired Dunlap to complete the reprint of their 1776 journals. 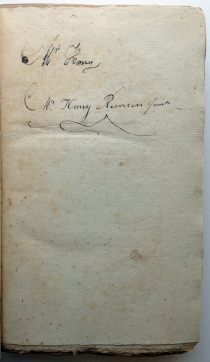 This copy bears the signature of Henry Remsen Jr., (1762-1843), the Chief Clerk of the State Department when Jefferson was Secretary of State. At that time, the Patent Office was part of the State Department, so among his accomplishments Remsen recorded the first rules for the examination of patents, a subject dear to Jefferson the inventor. Remsen later became a noteworthy New York financier. [DECLARATION OF INDEPENDENCE]. Book. Journals of Congress. Containing the Proceedings from January 1, 1776, to January 1, 1777. Volume II. York-Town [Penn. ]: John Dunlap, 1778. Second issue (i.e. Dunlap’s imprint but incorporating Aitken’s sheets). 520 pp., 8 x 4 ¾ in. Title page with New York City Bar Association stamp, discreet accession number on verso. Lacking the index (xxvii pp.). Own a Piece of History. To see our current inventory of copies of the Declaration of Independence and Declaration signers related material click here. In the fall of 1776, Congress ordered from Robert Aitken a uniform edition of their Journals. 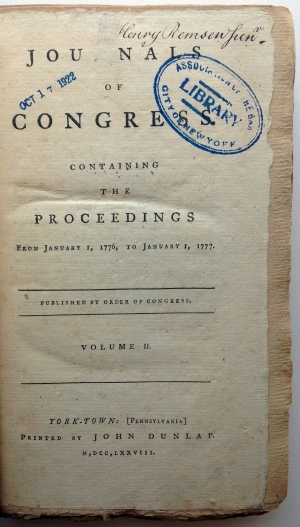 Aitken combined the 1774 First and 1775 Second Continental Congresses into his Volume I. He had earlier printed January through April 1776 as monthly issues (editions of eighty copies) solely for the use of Congress. He reprinted those months for his complete Volume II, which encompassed the entire year of 1776. 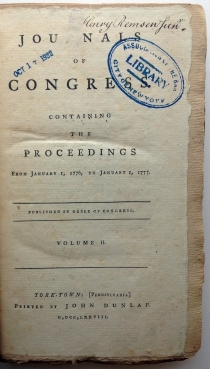 This second volume of the Journals, completed by Aiken in the Spring or Summer 1777, marked the first publication of the June-December 1776 Journals. On September 26, 1777, Aitken was forced to abandon his press and print shop as the British marched into Philadelphia, unopposed. He left Philadelphia with an unknown number of sets of pages 1-424 (in his original page count). According to Aitken’s account book, he printed 532 copies of the first edition. Bibliographers are unclear, but we believe that his count included the sheets he evacuated. 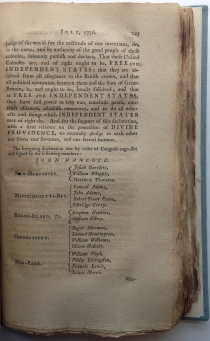 Page 241, (the first page of the Declaration printing) is exact—right down to a broken “f” in the final line on the page—in both versions, Aitken’s printing and the edition started by Aitken and completed by John Dunlap. Congress fled to Lancaster for one day, and settled in York from September 30, 1777 to June 27, 1778. 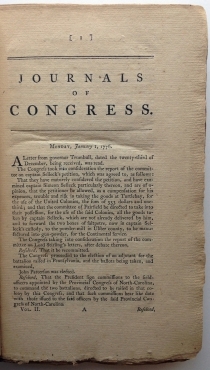 On May 2, 1778, Congress resolved to complete the second issue of the Journals. They hired John Dunlap, who used Aitken’s already-printed pages 1-424, and his own printing of the remaining pages. He added his own title page for the entire completed work. Therefore, despite the “York-Town:[ Pennsylvania]...John Dunlap” imprint at the front of this volume, the Declaration of Independence, on pp. 241-246, was not printed in 1778 by Dunlap at Yorktown, but rather, earlier, by Aitken, in Philadelphia, in 1777. It is interesting to note that the original July 4 Dunlap broadside, and all of the 1776 printings in any format, omit the names of the signers. Only after Congress had Mary Goddard of Baltimore print a new broadside in early 1777, and had the 1776 Journals of Congress published in 1777, did the names of the signers became generally known. This copy of the Declaration prints the names of all the signers but for the last one, Thomas McKean of Pennsylvania, who added his signature to the engrossed Declaration in 1781. The Journal does not note that the signing actually took place until August 2, with four of those listed here signing at various times between August 27 and November 19. It also prints the July 4 heading, “A Declaration by the Representatives...” rather than the updated “Unanimous Declaration” heading agreed to after NY voted yes later in July, and before the engrossed manuscript was penned and signed. 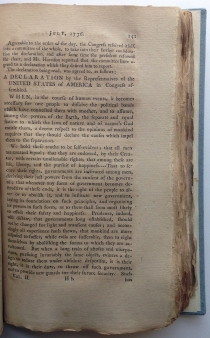 This particular volume presumably came out between Dunlap’s appointment on May 2 and the return of Congress to Philadelphia in July 1778. Henry Remsen Jr. (1762-1843) banker and real-estate investor, served as undersecretary of Foreign Affairs under Secretary of State John Jay from Mar 2, 1784. When the Department of State (Foreign Affairs) was formed under the Constitution following passage of the Act of July 27, 1789, Remsen became chief clerk in the Department of State until December 31, 1789. He served again, this time under Secretary of State Thomas Jefferson, from September 1, 1790 to March 31, 1792. He left in 1792 to become first teller of the New York branch of the Bank of the United States. Remsen later became cashier (the historical equivalent of CEO) at the Manhattan Bank about 1801, and served as its president from 1808 until about 1825. Remsen maintained a friendly relationship with Jefferson throughout his career. 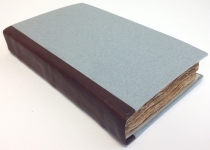 Professionally rebound to style with a quarter calfskin spine and blue paper boards. On the title page, the “R” of Journals” is scraped. Slightly toned, but internally sound and fine. The New York City Bar Association. Stamped October 17, 1922. < < Henry Remsen, Jr.
Evans 15685; Hildeburn Pennsylvania 3727. Georgia:Button Gwinnett, Lyman Hall, George Walton (p245-6).